This was a fabulous and long overdue return to Rubino. 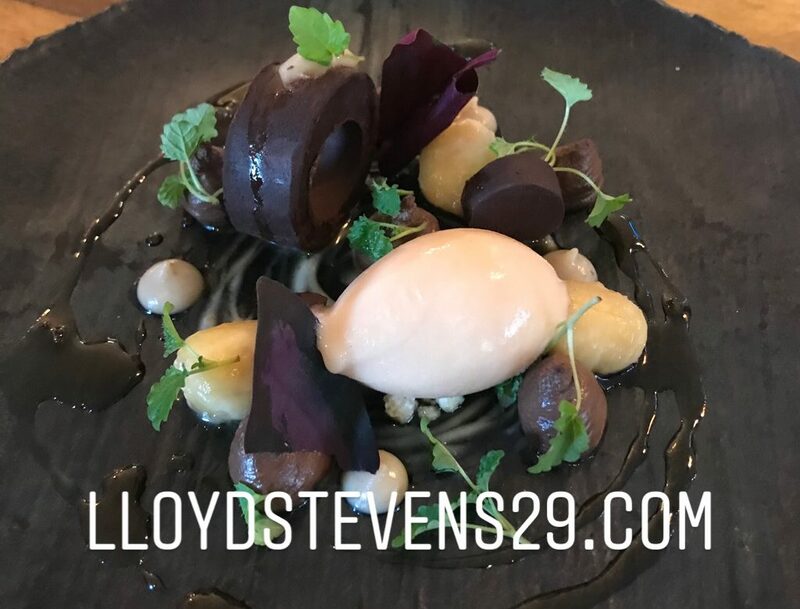 Unfortunately it had been over eighteen months since our last visit although during this time we did taste their food when Head Chef Rob teamed up with Haywards for a Tasting Menu evening to promote the Essex Feast book. The restaurant itself is in the delightful setting of Chigborough Farm which is only a very short drive from Maldon town centre. The restaurant which had recently undergone a refurbishment of a new floor and seating and to which was definitely an improvement is a small & quaint little place and seats about twenty people inside but also has the added availability for outside dining during the summer months. On our last visit we went in the evening for the Tasting Menu so on this occasion we thought we’d try the lunch menu. Well that was the intention anyway. We received a nice welcome and was shown to our table. We were then given the lunch menu to look at only to find a minute later our waitress brought over the dinner menu in case we would like to choose any of those dishes. It was then nice of Rob to come over and say hello. It was during this time we asked what we could have and to our delight was told that whatever we wanted to choose wouldn’t be a problem. So the end result was one of great joy as we decided to go for the seven course dinner Tasting Menu. We then looked at the wine list and decided to choose a Romanian Pinot Noir which was an absolute delight and it’s versatility matched each course perfectly. After enjoying an Amuse Bouche it’s was time for our first course the Wild Mushroom accompanied by Ciabatta , Poached Egg & Hollandaise and definitely a great way to start. This was followed by a fantastic Cockle Linguine with Chilli , Garlic & Wine. Following a little break in which Rob came over to see if everything was ok we moved onto a nice and meaty Ox Tongue & Cheek Terrine with Pickles , Beer Bread & Mustard. Our next course was another fabulous dish a Jerusalem Artichoke Risotto with Walnuts & Winter Truffles simply fantastic. The next course was a fabulous Cod dish which was a great way to freshen the palate after the Risotto and before moving on to the main course. The Cod was accompanied with Purple Broccoli , Romesco , Breaded Mussels & Almonds. This led us perfectly on to our final course a stunning Veal Loin , Sweetbread , Lentils , Cabbage & Bacon just a great way to finish. We then needed a rest before moving on to desserts. This gave us another opportunity to chat with Rob firstly about the dishes we’d just had but also about his plans for the year ahead to which he seemed very pleased with as he would soon be stopping breakfasts so therefore could offer more choices for lunch and dinner. So now to desserts and you should know be by now I can’t just have one so therefore for my first I chose the heavenly Chocolate Stout Cake with Malted Ice Cream & Nut Crumb. Then to finish with a delightfully light Rhubarb & Yoghurt Parfait with a Lemon Profiterole & Ginger Biscuit. My wife on the other hand only had eyes for a dessert on the lunch menu a Rice Pudding with Poached Plums & Honeycomb. These desserts rounded off a truly fantastic lunch and after finishing with an Artisan Tea brought and end to a fabulous afternoon. The food here was fantastic with it’s touches of Italian influences so yes if your in the Maldon and are looking for somewhere nice to eat then take this very short drive and enjoy a fabulous lunch or dinner at this wonderful restaurant. I for one will be looking forward to a return as soon as I can. So don’t delay and book a table today as this is another great restaurant in Essex. Mouthwatering post Lloyd! Thanks for sharing!